Patriot. He was a Surgeon to the Maryland Marching Militia and was entrusted in the safe keeping of the Maryland State Records during the Revolutionary War and War of 1812. It was feared that Annapolis would be attacked and burned so the records were sent to Upper Marlboro. Annapolis was spared of invasion during both wars but Upper Marlboro was invaded three times but with no destruction. As one unit was leaving the town two drunken stragglers were seen and out of disgust he arrested them without thinking about the safety of the destruction of the town and records. He was arrested and sent to Baltimore. The townspeople enlisted the help of Francis Scott Key and Colonel John Stuart Skinner in gaining his release. Being successful in obtaining that release, the three were heading back to Upper Marlboro when they witnessed the fiery attack on Fort McHenry. That attack inspired the writing of the Star Spangle Banner by Francis Scott Key. 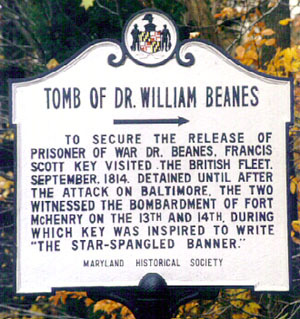 Without the arrest of Dr. Beanes and the loyalty the townspeople had towards him Francis Scott Key would never have been in Baltimore and the Star Spangle Banner would have never been written. On October 13, 2012 an event was held in which this date was proclaimed Commodore Isaac Chauncey Day in Bridgeport, Connecticut. This video shows part of the history ceremony which was held by the Black Rock Community Council to honor Commodore Chauncey, had many accomplishments including working to end the War of 1812. Resting place Congressional Cemetery, Washington D.C.
Pushmataha (c.1760's - 24 December 1824; also spelled Pooshawattaha, Pooshamallaha, or Poosha Matthaw), the "Indian General", was a chief of the Native American tribe of the Choctaws, regarded by historians as the "greatest of all Choctaw chiefs". Pushmataha was highly regarded among Native Americans, Europeans and white Americans for his skill and cunning in both war and diplomacy. 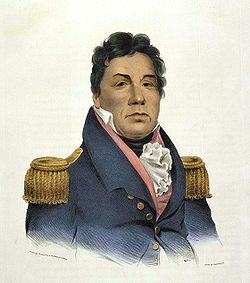 Rejecting the offers of alliance and reconquest proffered by Tecumseh, Pushmataha led the Choctaws to fight on the side of the United States in the War of 1812. He negotiated several treaties with the United States. In 1824, he traveled to Washington to petition the Federal Government against further cessions of Choctaw land; he there met with John C. Calhoun and Marquis de Lafayette, and his portrait was painted by Charles Bird King. He died shortly thereafter and was buried with full military honors in the Congressional Cemetery in Washington, D.C.. Andrew Jackson marched in his funeral procession down Pennsylvannia Avenue.